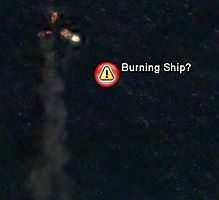 Google Earth Blog: Google Earth Sleuthing - Burning Ship? There was alot of cool discoveries on google earth, some guy even spotted a 2nd world war bomber flying over a major british city (don't remember the name), but I've read that on "the register". This is amazing. This truely shows what an internet community is capable of. Does Google Earth have a schedule that they stick to, that would let us know when and where they will take and post there next picture. I have a few marketing campaigns that would pay big bucks to see there logo on Google Earth. Wow, this is certainly a wonderful coincidence. That IS amazing. Such a big world, yet so small. The way the 'net brings people closer never ceases to amaze me. That's cool, but it is true??? That is incredible. Truley a mad coincidence. @Steve: AFAIK, Google doesn't have their own satellites (at the moment, anyway), but rather they make use of public domain data made available by the US government. This means it may be somewhat difficult to predict when a given area is going to be next updated.